Get ready for the most sensational video baseball game ever! 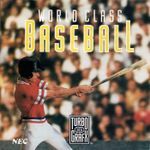 World Class Baseball lets you apply virtually all of your baseball skills and knowledge in this classic game of hit and run. Begin by choosing among 12 different teams. Turbocharged action lets you play against a friend (with optional TurboTap accessory) or take on the computer. Then choose your pitcher. Bunt, throw curves, throw fast balls, catch your man off base, even call in relief pitchers. You'll always know 'who's on first' as World Class Baseball keeps track of batting averages and other vital statistics. Watch as your batting and fielding techniques improve with practice. Apply game-winning strategies. Hear the roar of the crowd--the crack of the bat. World Class Baseball is bound to provide you with hours of world-class enjoyment in a true big-league environment. All set? Then, 'batter up!'"